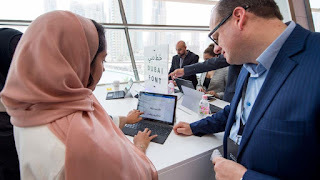 The Dubai government on Sunday announced the launch of “Dubai Font”, the first typeface developed by Microsoft for a city, which will be available in 23 languages. The Executive Council of Dubai, which manages the affairs of the city-state and is headed by Prince Hamdan, said the font reflects the United Arab Emirates’ vision “to become a regional and global leader in innovation”. “It is the first font to be developed by a city and to carry its name”, Executive Council secretary general Abdulla al-Shaiban told a news conference. Home to the world’s tallest tower and the largest shopping mall in the Middle East, image-conscious Dubai has pushed in recent years to broaden its appeal by investing in its technology and culture. The emirate also aims to emerge as the world’s happiest city, and last year appointed a happiness minister. In 2016, some 14.9 million tourists visited Dubai, the most liberal of the UAE’s seven emirates and its least dependent on oil revenues.